What about Akeeba Backup. 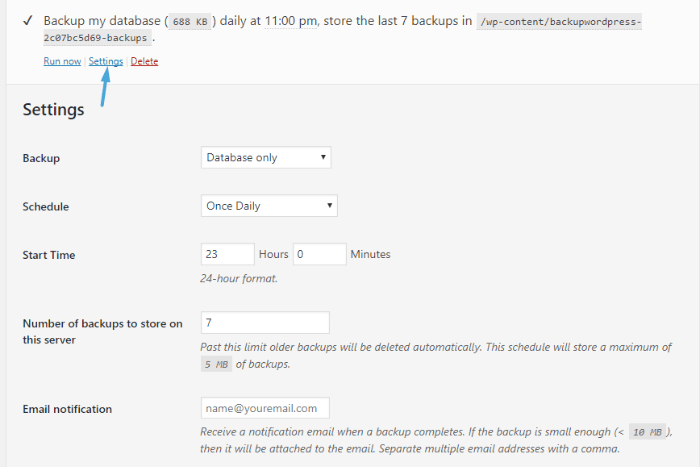 That has been my goto backup for Joomla for years, now I use it exclusively in WordPress too. Hey Dom, I’ve never heard of this one. Will check it out – thanks! Hey Dom, he talked about WordPress backup alone. 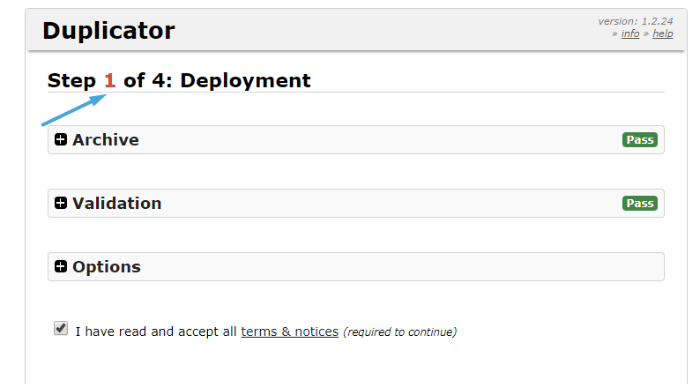 that of Joomla will be the next post – I think! Jon, Akeeba has a WordPress version….that is what I was talking about. I think people often underestimate the need for backups until disaster actually strikes. I would also add that both backup and restore should be tested before you actually need it. Great comprehensive article. BackupBuddy’s lack of response, no free trial and no-refund policy makes you wonder if they have something to hide. Yes and yes to underestimating and testing 🙂 Backups are easy to discount until you actually need them – then they’re vital. If you’re happy with UpdraftPlus I don’t think you need to switch – UpdraftPlus is a great solution. First thanks for writing this valuable article. Yes, you are right. Being a blogger it gives me nightmares whenever I think about loosing my entire work just because of a hacker looking for some adventure. 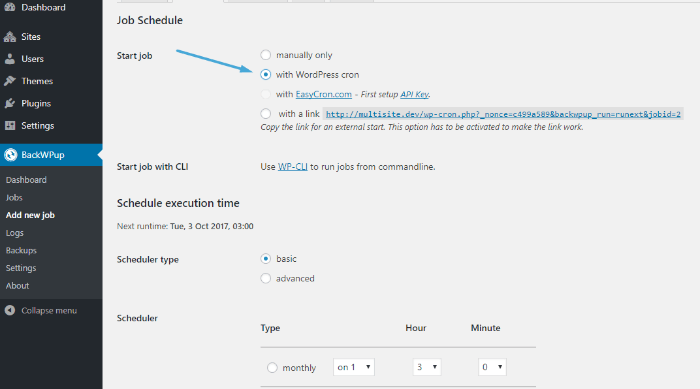 Never thought that there’d be WordPress plugins to take care of it. BTW my webhosting by default, provides me backup services. Do I still need to install these plugins? And if I install these plugins and restore backups from them, will they restore all the data as is? I mean along with all the modifications that I applied to my WordPress theme and/or template or just the articles and media libraries will be available? -Make sure you actually know how to restore your site from the backup. I’d also double check to see how often your host backs things up. As for your last question – all these plugins are built so that you’re able to restore a 100% identical version of your site. You didn’t mention Manage WP. May I ask why? I like Manage WP! (I write for their blog, too 🙂 ). I wouldn’t really consider Manage WP “just” a backup solution, though. Like the other features! I don’t even understand the other features. I’m a newbie who isn’t technically inclined and just really can’t handle Manage WP’s complexity. I’ve been thinking, what do I need all this for, but didn’t know of a better alternative. Your post has resolved that issue for me. I intend to move to Updraft Plus. And that’s going to be a real relief. Thank you. Hey Colin – great to finally see a blog post covering WP backup solutions that’s this objective – 99% of the information online on the topic is really salesy. I’m a recent convert to Updraft Plus after years of fiddling with different solutions that just never quite hit the mark. I love the offsite storage option because I know no matter what (accidental tweaks that bring the virtual house down) I have a full backup I can fall back to. Evaluated Backup Buddy for a while, but can’t see myself moving away from Updraft now. Good list indeed. 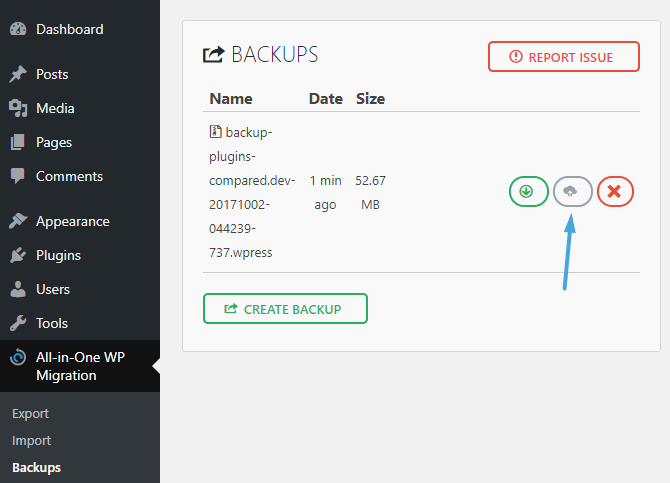 Creating regular WordPress backup gives us peace of mind and it saves our site when our site gets hacked or accidentally locked. 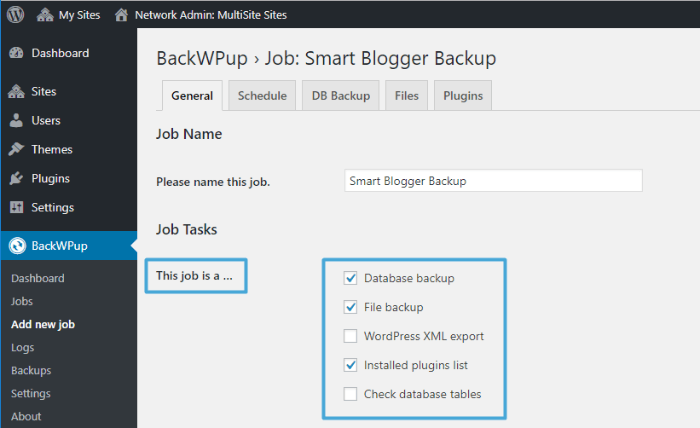 Your mentioned plugins are really effective to do the best jobs for my WordPress backup. I just want to include here my favorite one. The “Backupbuddy”. It is a popular premium plugin. 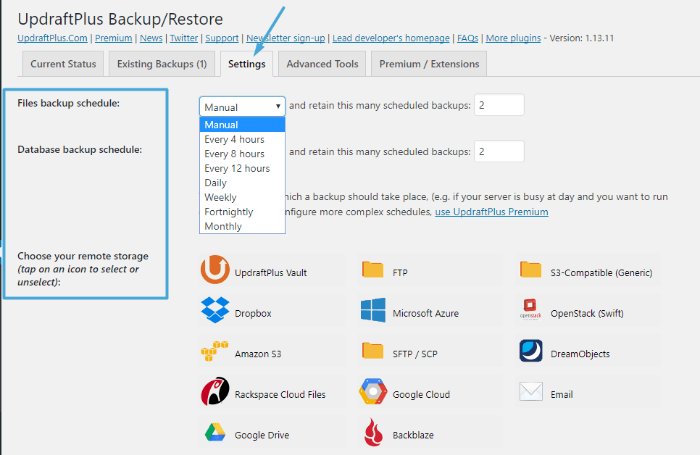 It has a feature of adding your site backup automatically in Dropbox, Amazon S3, Rackspace Cloud, FTP, Stash (their cloud service), and even email it to yourself. Even the free version wor ks good for sites. Hey Rana, glad you like it! I don’t think BackupBuddy has a free version, though. I wasn’t able to test it for this post because we were unable to get our hands on a copy. You’re literally saving people’s business here. A few years back I lost TONS of articles because I figured, “hey, that’ll never happen to me”… but ouch man, I landed with a bump. The host weren’t taking backups, and that was a costly mistake. Not all hosts look out for their customers. So, thank you for looking out for us. Glad you’ve got better backup practices now 🙂 But yeah, it’s really hard to convince people how important backups are until they experience it (which is usually a tough lesson to learn). Whenever I update my Website I never take backup, but now I can. 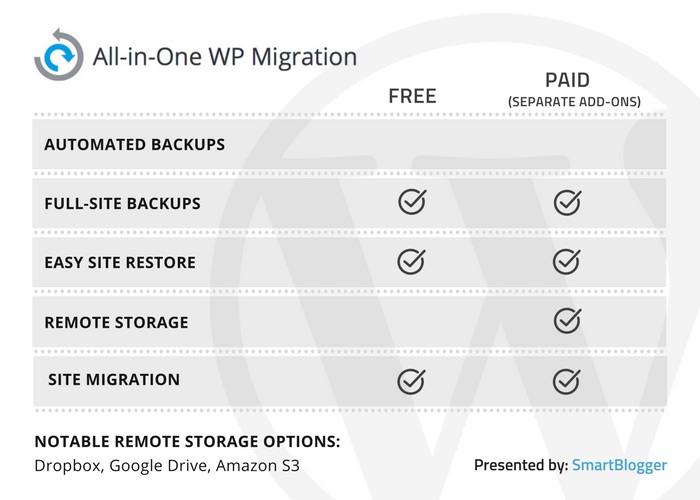 Great info, But Hostings are providing – Automatic backups for your website. Which one is better through plugin or automatic ? -If you know how to restore from it. -If you’re downloading it to your local computer to make sure you have your own copy. But don’t trust your host to both back up your site AND store the back up for you, because that’s a single point of failure, then. Superb Sharing.I Find Best Plugin To Save my website Backup it is very helpful Article for me.Thank You.Keep it up.Have a nice week ahead. Yes. Backing up your content keeps you stay secured if something wrong happens with your blog. And, the plugins are powerful enough to provide the backup service. In fact, I don’t use any plugin to back up my content because my hosting company takes care of that. Still, I’ll check the plugins if they provide better services that my current one. Thanks for sharing such an in-depth post. I think you’re fine with your host doing it – but I would just make sure to download those backups to a separate location, otherwise your site still has a single point of failure if something bad were to happen to your host. Hi, thanks for the suggestion. Sure, I’ll do that ASAP. I had installed and activated UpdraftPlus on one of my blogs and since the day, I’ve been enjoying it. I personally thank you for raising such a concern and for that, I could utilize the power of backup through WP plugins. Thanks for sharing. I use UpdraftPlus and I love it. Their features are just the best. Once they backup, they send it directly to my dropbox. Sure thing! I do the same and send mine to Google Drive and then periodically download to my own computer for extra backup. Thank for this, UpdraftPlus is the one I use and its cool enough and relaiable. Thanks for the detailed article. 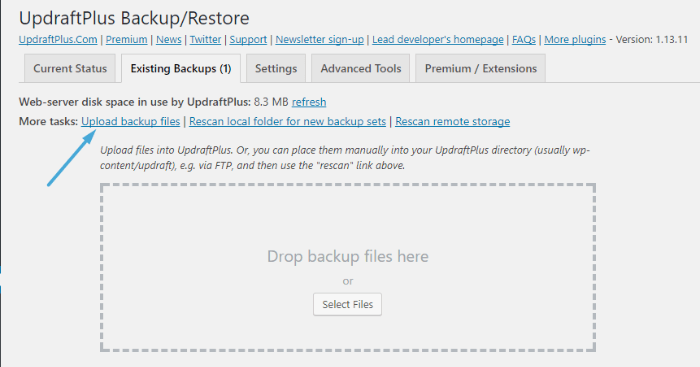 I am using Updraftplus wordpress backup plugin. I want to go for paid backup plugin. Can you please suggest some good plugin among this list? If you’re happy with UpdraftPlus I don’t think you need to change anything. 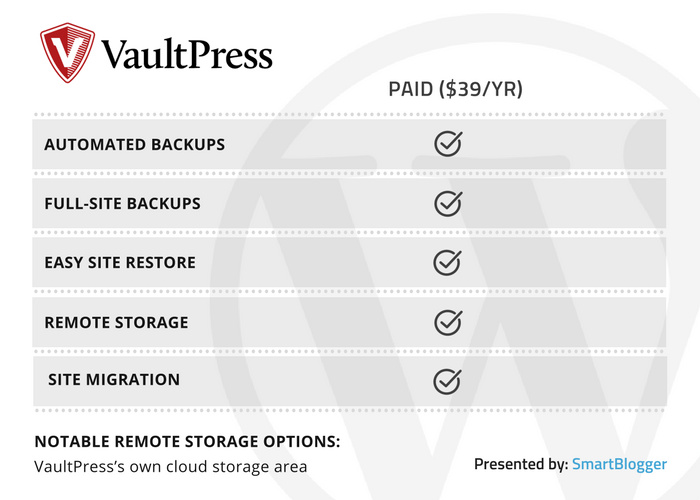 But if you really want to pay VaultPress is pretty simple – just not free. 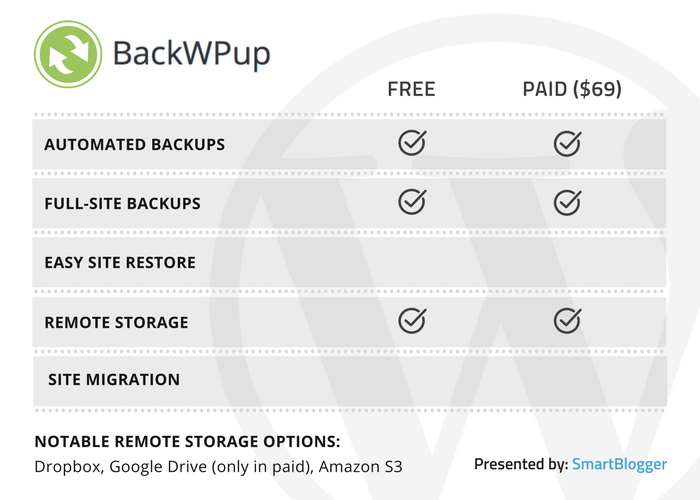 I’m in the process of switching from Manage WP to Updraft Plus, and I’m working on storing my backups on Google Drive. I’m getting a message saying that Updraft Plus wants to view and manage the files in my Google Drive. Everything on my laptop is in Google Drive. Seems to me I don’t want Updraft Plus viewing or managing anything. I just want it to create and store my backups. It doesn’t seem like that’s an option, though. It seems like, you either let us into all your files, or you can’t use this plugin. Can Colin or anyone who actually knows what you’re doing please give me a hand with this? That’s perfectly normal – UpdraftPlus needs those permissions to actually upload the backup files. Otherwise it wouldn’t be able to store them for you automatically. I don’t think there’s any problem with giving it access (I’ve never experienced an issue and UpdraftPlus is a pretty established entity), but if you’re worried you could use a free Dropbox account specifically for backups. That way you could still have automatic offsite storage and bypass the issue. Dropbox doesn’t act right on my laptop, so I now stay away from it. Given your assurances, I went ahead and completed the process of connecting Updraft Plus with Google Drive. I really appreciate your assistance, Colin. So glad you wrote this post. Thank you. Huge fan of UpDraft plus!!!! Ha said me so much time! The thing I liked about your post is you have listed Updraft Plus at number 1. 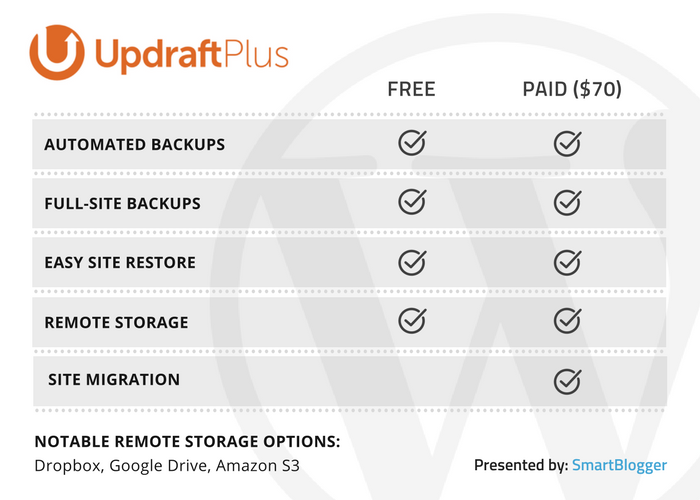 However, Updraft Plus is something that is really easy to backup & restore a WordPress site. Updraft Plus do deserve the #1 ranking. The best part is It’s completely Free & beginner friendly. I have tried Duplicator and Updraft. While the former did a splendid job, Updraft is by far the most advanced and feature-rich. I use UpdraftPlus their premium version! It’s easy to use and configure! And another one I used is WPtime Capsule it is also very good! I’ve never heard of WPTime Capsule – will check it out. Thanks! Thank alot for this big list and exemples. its not easy to find a good backup plugin easy to use and powerfull. 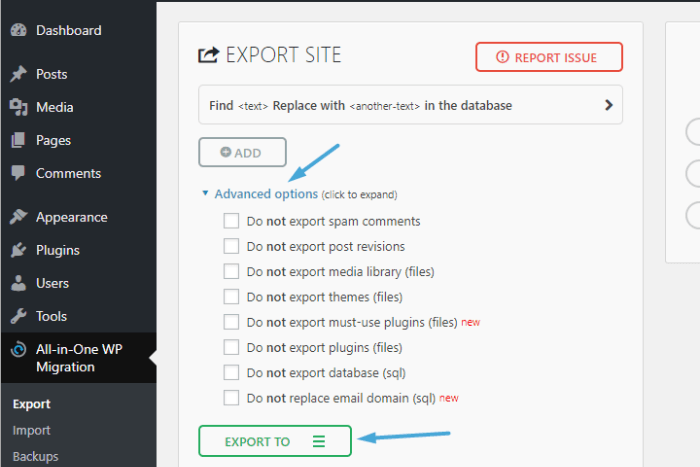 Great idea to back up my website data and the plugin features are very useful and user friendly! Wow! Really excellent piece of content. Will definitely follow for my website. I think all the important backup plugins are covered here. Thanks for curating this awesome post. 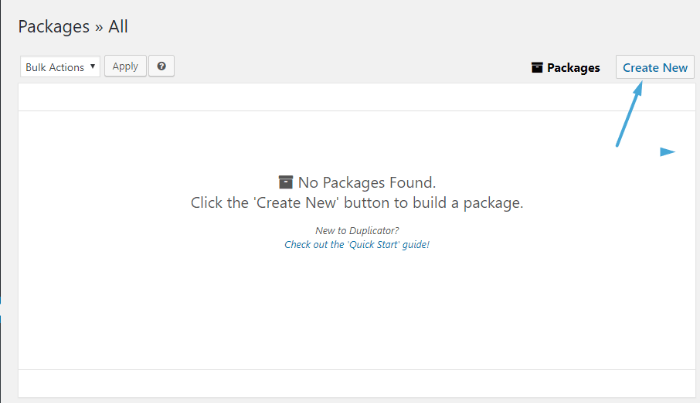 Great article with detailed information, but unable to understand why you do not include WP Time Capsule on your list. It used the cloud apps’ native file versioning system to detect changes and maintain file versions that mean less server resource usage while backup to cloud apps and restore. Woo, I was looking for WP Backup plugin recommendation, thanks for your such informative article. I am new to blogging and, after reading the account of another blogger losing EVERYTHING, was searching for an easy and affordable (i.e. free) solution. Looks like UpDraft fits the bill. Thanks for your insight and providing value in your posts. I am planning to migrate blogger to WordPress. It definitely helps me a lot. I will follow this. For me UpDraft has always been my favorite. Tons of features and functionality. Also the free version is perfectly fine! 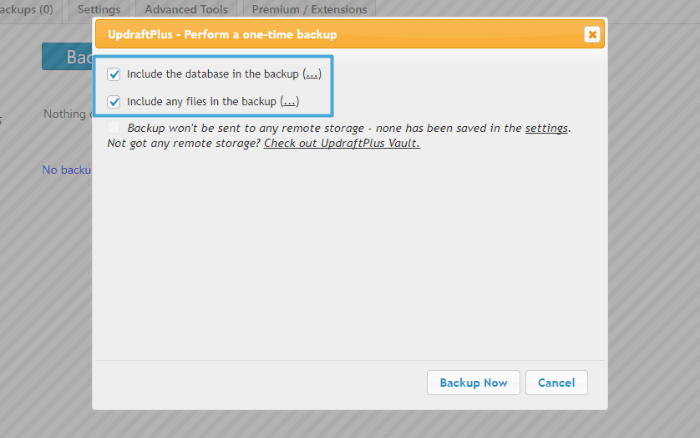 We always use UpdraftPlus for backups and migration. It is very simple to use it for cloud backups like Amazon S3, Dropbox or Google Drive and makes it easy to build development environments for our customer projects. I use VaultPress to backup my blog. I have been using it from almost 1 year. I will be renewing it this week. I find VaultPress quite friendly, easy to use and affordable as well. Looking forward to try something new for my new ventures! Great post, I’d have to agree with the above recommendations. This post is a great source for people searching for information on WP backup plugins. Any best plugin to know from using which keyword visitors are coming from search engines to my website?? I dont know that much about this topic, but I understood more from the article. Securing your website file is really important because we cannot depend on web hosting to make backup for us because sometimes file corruption cannot avoid and yea i agree that we should have a backup of own wordpress files so in any case we can just access those backup when we need it. 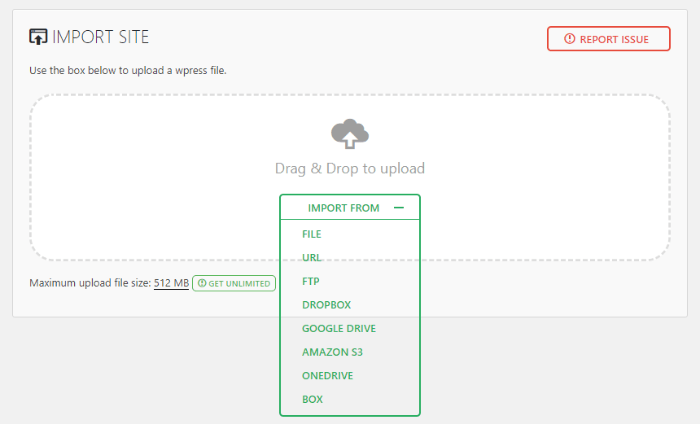 I suggest you guys use Updraftplus because of its automation in backing up your wordpress files. I feel safe with them. Thank you this extremely helpful! 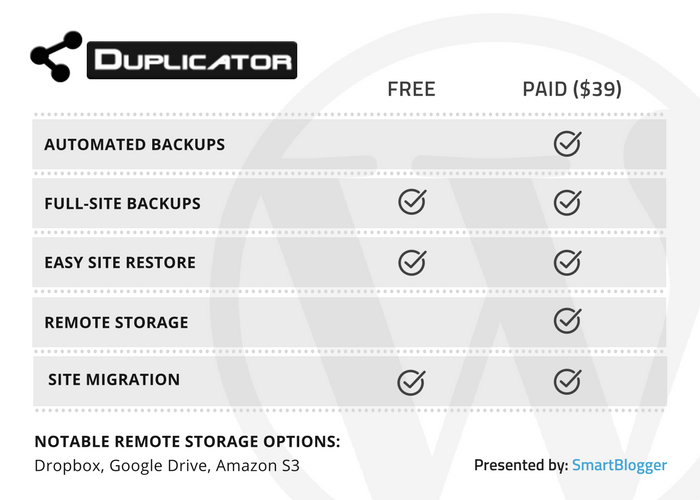 It’s seriously like wordpress for duplicator. Thanks! I personally think that the information that you are sharing with us is pretty amazing and I just want to thanx for it a lot. Your blog is amazing. thank you very much! just what I needed to know, now I just have to get down to work! I’m happy with you, keep it up. We have started applying updraft plus for backups. 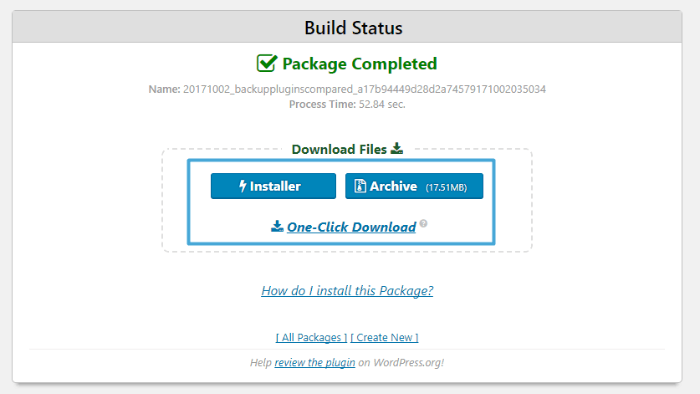 This is the first time I’m reading your blog and believe me your post have seriously helped me 6 Best WordPress Backup Plugins . Thanks for sharing……. 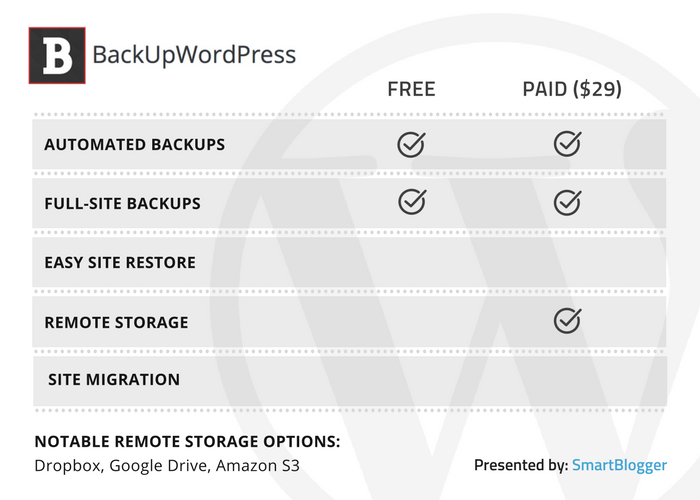 What an amazing article – a round up of the best backup plugins for WordPress. Just read and schedule this post. It’s a timely article since many of us seems to get overwhelmed with the various plugins in the market-place, and not being able identify the best for your site. The insight for each of these plugins makes it a lot easier for one to make a choice.